If you’ve written a book, you know that marketing the book is more important and more difficult than actually writing it. And, an effective book and author platform marketing strategy is content marketing. Or, if you're marketing your services or products, the same is true. You need to generate visibility and authority through content marketing. This marketing strategy includes posting to your site on a regular basis, sharing on social media networks, submitting to article directories, and being a guest on quality blogging sites. 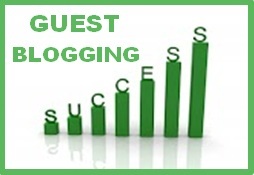 This guest blogging strategy is important whether you're a marketer, a writer, or an author. • It affords you a wider audience and often this leads to clicks back to your site. • It allows you to cement your expert status - your authority. • It provides the host site with fresh content. • The host site will get additional traffic from your promotion efforts. Keep in mind that quality content is what counts! With your quality content in hand, the first step is to find a blog that gets good traffic and offers quality content. If you’re not sure about a site, you can go to http://alexa.com to check the site’s authority. At this point, you have the content and you have a website that will accept it. Now, it’s on to the tips. 1. Check the host blogging site’s guidelines carefully. And, be sure to know what type of content the site publishes, along with what’s already been done. You don’t want to offer to guest post about Google’s Penguin when it’s been done before. 2. Provide a brief bio with a link to your site or landing page (do not embed the link – provide the complete URL). If you don’t have a website set up yet, use your Twitter or Facebook URL. 3. Provide relevant tags for your host to use. A minimum of three tags should be included with your submission. 4. EDIT your content before sending it off. 5. Ask if the host would like you to send a relevant image for the post. A number of sites are requesting images accompany the posts to save time. 6. Thank the host for allowing you to be a guest blogger. 7. Once your post is published, promote it, promote it, promote. And, in you promotion, ask for visitors to leave a comment. Bringing traffic to the hosting site is nice, but getting comments is even better. 8. Stop by throughout the day to respond to any comments. 9. Stop by periodically for the next week to see if there are any other comments. The most important tip is to be professional and courteous. These qualities go a long way in building relationships. Marlene, I'm glad it is helpful. Thanks for stopping by! Perhaps the best tip I can give to a guest blogger is... don't write about some obscure or private topic. Nobody will read to the end, let alone leave a comment. Link your topic to one of the Seven Deadly Sins (well, let's call them the primal imperatives). That was a challenge for one of my accountancy clients, until he hit on headlines like: 'Seven Lazy Ways to Save Tax Legally'. Yes, this is very helf\pful, thank you. Maria, I'm so glad you found the post helpful. Thanks for stopping by! Dr John, I love that title! It's also important to have your guest post meet the hosting site's topic.